If you live pretty much anywhere on the east coast of the country above South Carolina, you are probably experiencing some snow today. In southeastern Virginia, we started getting snow yesterday afternoon and through the night. And if there’s anything that below freezing temperatures and a few inches of snow makes you want, it’s soup. A certain soup company has made like a zillion dollar or something on this concept. Ehhh? Please don’t sue me for the unauthorized use of this picture, soup company! 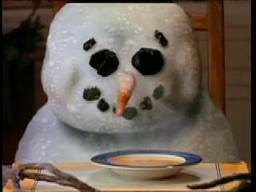 So last night I got the soup pot fired up, but unlike this creepy snowman kid, I did not turn to the standard snow day soup . . .
Move over, Chicken Noodle – there’s a new soup in town! Add all the ingredients to a large, heavy stockpot, bring it to a boil, then reduce to low and simmer for 1.5 hours. 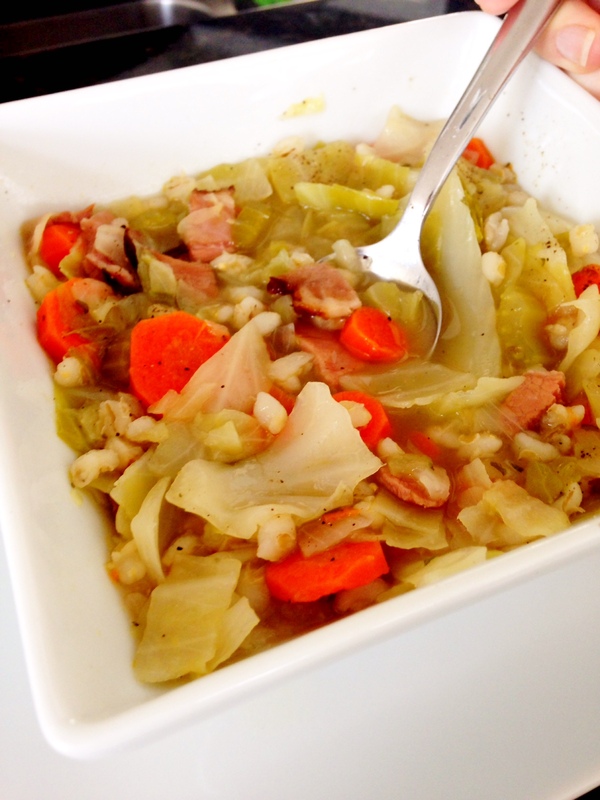 Soup is ready when carrots and cabbage are tender and barley has fluffed and cooked through. 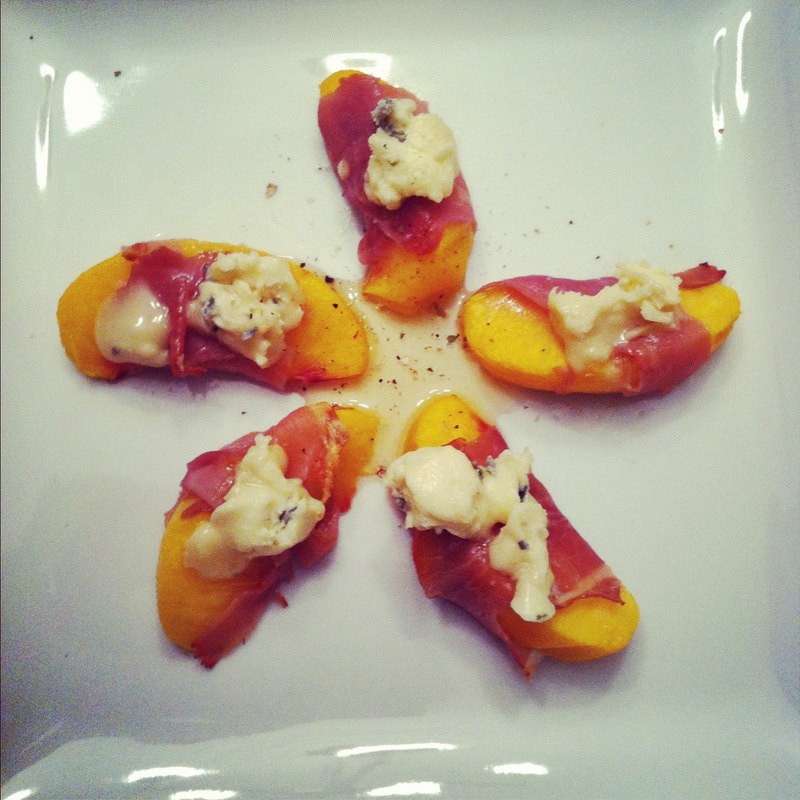 A quick note about the ham. You can use any kind of ham you want here – I made this soup because I had a little less than a pound of Honeybaked Ham (on the bone) left over from a brunch. 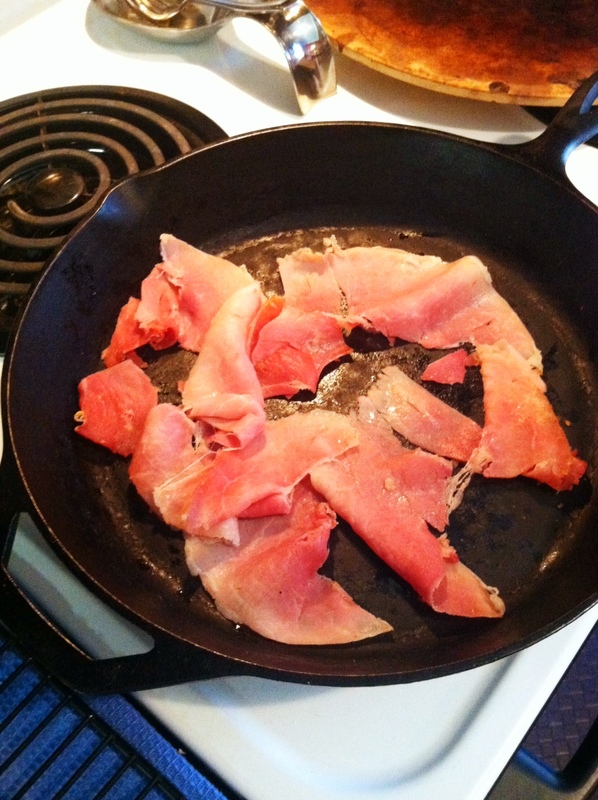 I usually make this soup with a salted, country style ham to give the soup the saltiness I like. But if you prefer sweet ham and don’t need or want your soup to be salty, then use that. Another note that the cabbage, carrots and onions came from our Winter CSA that we are getting from Cullipher Farm. Yes, there is fresh, local produce available in the winter! In addition to those ingredients we also got potatoes, kale, turnips and collards in our box last week. This soup is very filling thanks to the barley. Barley is a whole grain that is high in fiber, which means it helps with digestion, can lower cholesterol, keep blood pressure low and reduce the risk of type 2 diabetes. Barley is more effective at all of these things than whole oats, so it’s a good substitute every once in awhile. For those with diabetes, pearled barley has the lowest glycemic index of all the common cereal grains (such as wheat, rye, oats, etc). This means that even though it is a carbohydrate, it won’t raise your blood sugar as much as other carbs. It’s glycemic index (when boiled) is 35. Additionally, carrots, cabbage and onions provide a wide variety of nutrients from Vitamins K and C to powerful antioxidants that protect our bodies against a host of things, including cancer. So while chicken noodle soup might ward off a cold, this soup is fighting cancer. And with high fiber barley rather than high-glycemic noodles, to boot. So make a bowl and sit back and enjoy the snow. It doesn’t leave much room for a little altruistic holiday like Thanksgiving that focuses on being grateful for what we have instead of insistent that we get all the things the TV told us we need. Which is why I try my best to be a Thanksgiving cheerleader. It is, after all, the one day of the year that everyone collectively does this thing that I am constantly trying to convince people to do: get into your kitchen, cook a meal for people you love that is inspired by seasonal produce, then sit down at a table together and eat it slowly. Then, of course, the next day is the one day of the year where everyone does the one thing that actually makes me want to not be a part of the human race. The contrast between Thanksgiving and Black Friday could have been the socioeconomic topics of one of George Orwell’s books had he lived long enough to see the monstrosity that is the biggest retail holiday of the year. Don’t get me wrong, I’m a free-market capitalist as much as the next gun-toting Libertarian, but there’s a right way and a wrong way to support the economy and we all vote with our dollars whether we vote for massive corporations who export jobs and manufacturing to China or whether we vote for small, locally-owned companies whose owners create jobs and reinvest those dollars back into our community . . . . but I digress. 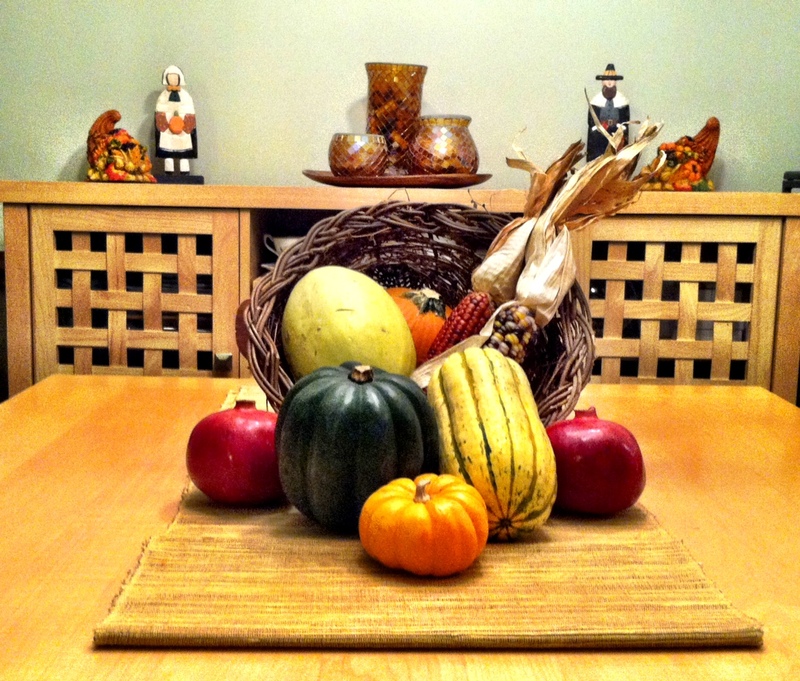 Whether or not the traditional Thanksgiving story is true, and whether or not the things we eat each year really represent a traditional early-American harvest, the bottom line is that the meal is still a celebration of bounty, inspired by the local, the seasonal, the gracious things in life. And I love it. My personal family traditions have changed over the years. As a kid, our entire 30+ person extended family would all come to my parents’ house for Thanksgiving, so it was always a really big deal. We would get up early in the morning to help my mom set the house up for the influx of people, and then as the sun went down, people would start pouring in, and the whole evening was just complete bliss for me. I love my family so much and even though most of us lived next door to each other on the same dirt road, it was somewhat rare that we are all in one place at one time, so for me, it was like this amazing Thanksgiving miracle. And everyone could cook so damn good. There were usually at least 20 dishes spread out around the kitchen, everything from corn pudding to collards to stewed tomatoes (this is the south, after all) and of course the traditional turkey, ham, green bean casserole, mashed potatoes, etc. As we’ve all grown up, the grandkids have gotten married and it’s harder to get everyone together at the same time, and so traditions have changed, and Jeremy and I usually spend every other Thanksgiving with his family in Ohio, which I also love and which includes a very different list of dishes like Galumpkis, Kielbasa and Pierogies (are you sensing that someone is Polish?) 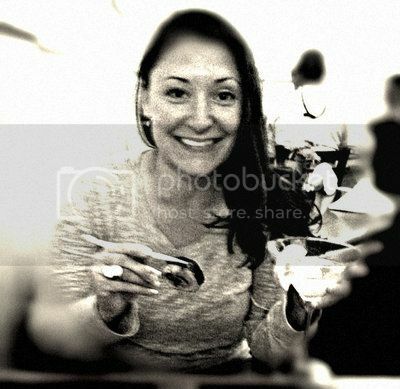 But the day itself and the meal is always the same: full of love and tradition and thankfulness and I am a complete sucker for that. So in the spirit of Thanksgiving and with those big family dinners playing out in my mind, I share with you a recipe for genuine southern collard-greens (pronounced ‘collargreens’, no d, all one word). Please understand, though, that cooking up a mess of greens requires a tiny bit of know how and personal preference. This recipe is more of a guide. As you cook them more and more, you’ll figure out exactly how you like them. If possible, get collards from the market or farm cut right at the base of the plant. 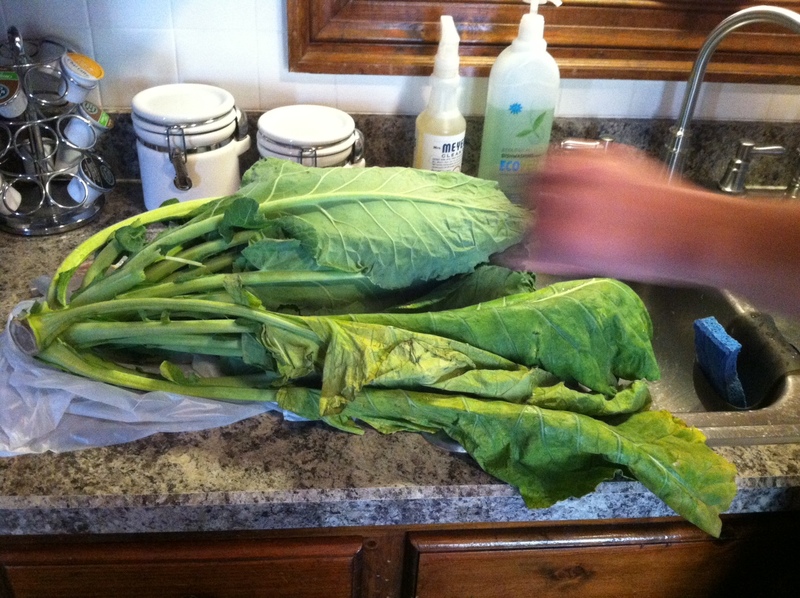 Thoroughly rinse each individual leaf off the collard plant and then tear the thick rib/stem off each leaf. Roll leaves together like a cigar, then cut crosswise into strips. Do this with all the collard leaves. Stir in the baking soda and pepper to taste (and jalapenos if you’ve chosen to do that) and begin adding water as needed (This is where the know-how and experience comes in. You don’t want them too soggy, but you don’t want them to burn. They’re just sort of stewing in the water bath, so add it as you need, but not too much). Really taste the collards before adding salt – the meat you’ve used generally makes them salty enough. At this point, you can continue to let them simmer and cook on low on the stove top, or you can transfer them to a crock pot and leave them on low for a few hours, or you could even just continue to cook the water down in small amounts in your pot , doing a braising method that would results in less “soggy” greens. It’s totally up to you, I’ve done it every which way, depending on what I want and how much time I have. If you’re braising them, just keep stirring in water every 10 minutes or so and stirring the greens until they are done to your liking (30 minutes or so?). 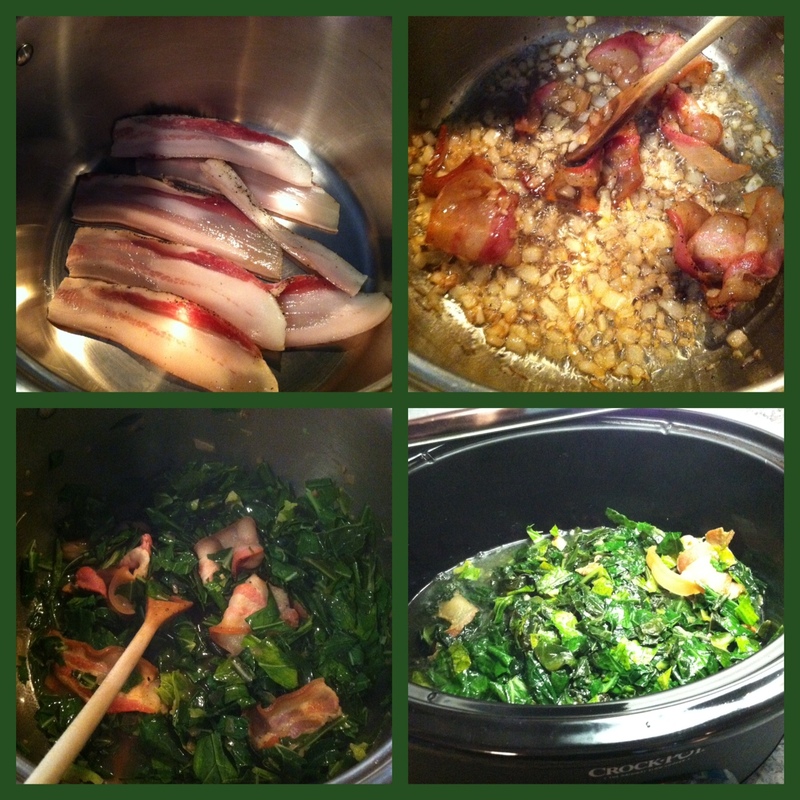 Otherwise, simmer or slow cook for 3-4 hours on low, for very Southern style greens. Serve warm with more cider vinegar or pepper vinegar, salt and pepper. What are your favorite Thanksgiving dishes? What can you not live without eating on the big day? We interrupt your previously scheduled Friday . 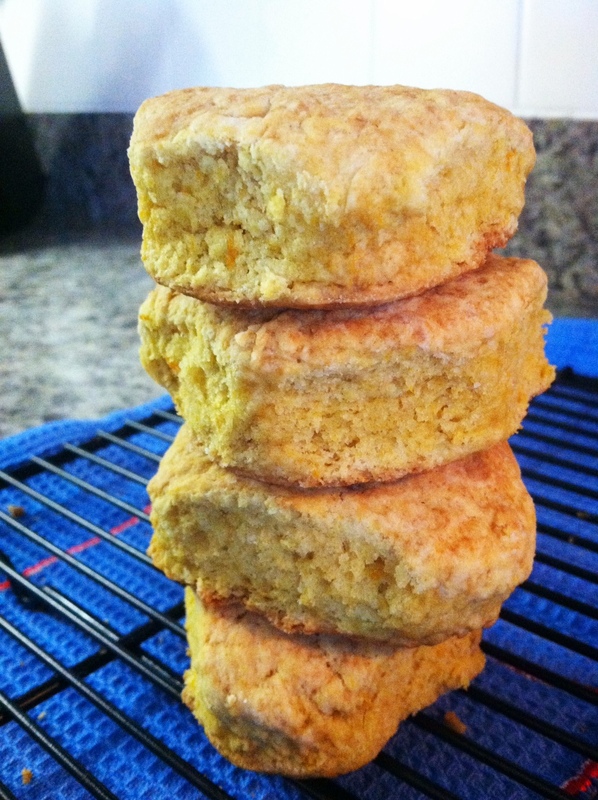 . .
To remind you that sweet potato-ham biscuits are delicious and should be eaten daily. 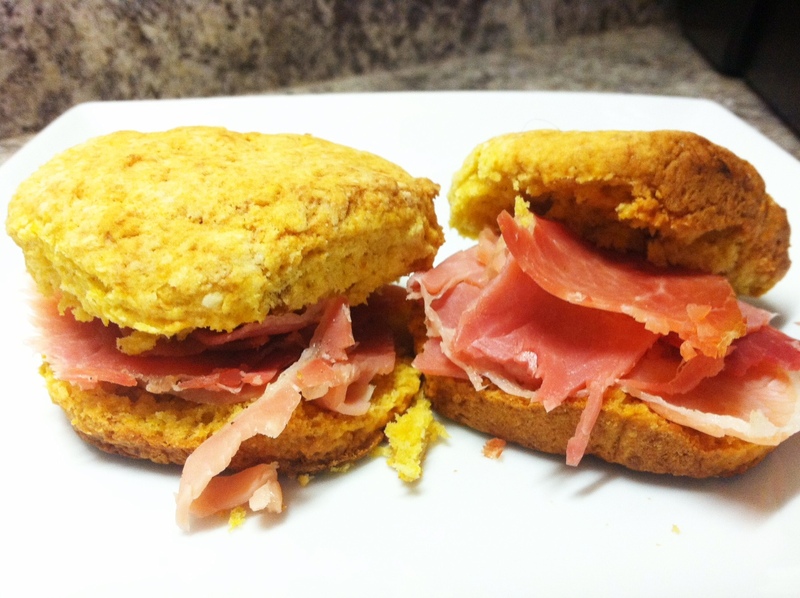 Edwards Ham and homemade Martha Stewart sweet potato biscuits made with local sweet potatoes. It would be a crime to live through another weekend without making these. Don’t break the law of ham. Just make some.